Don’t be fooled, he’s in no danger here. Armed Only With Butter Knife + Insurmountable Odds = Guaranteed Easy Victory. 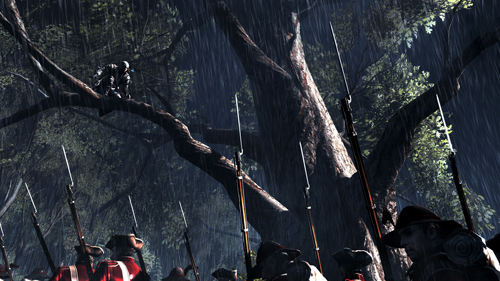 Like all Assassin’s Creed games, AC3 has a lot of promise that’s spoiled quickly by game design mistakes. The programmers did an outstanding job creating the game, but all that hard work was spoiled by what I can only imagine were executives making design decisions. It’s a brilliant game engine, absolutely gorgeous. 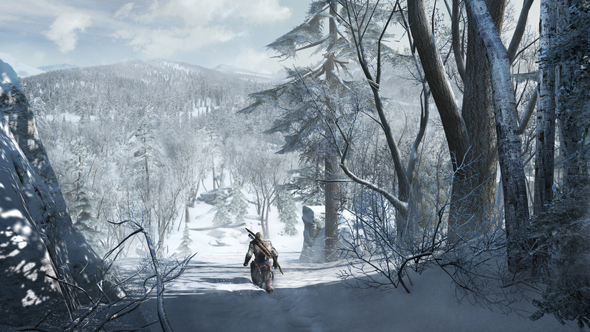 The scenery is stunning, the weather effects believable. When it’s snowing, you feel cold. Summer feels hot and muggy. Character movement is smooth and intuitive. The world is vast and interactive. There are some terrain glitches here and there, but that is to be expected in a game this large. 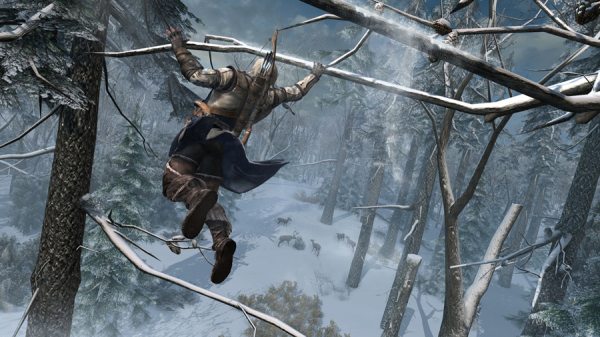 The only gameplay aspect that I didn’t feel was programmed well were the horses, which never quite felt like you were in control of, got inexplicably stuck on minor terrain bumps, and somehow felt worse than the older AC games. But like I said, all that programming genius was wasted by some design decisions that turned an interesting and exciting story, into a single-track borefest. The first, and most egregious, is that there is no difficulty setting for the game. 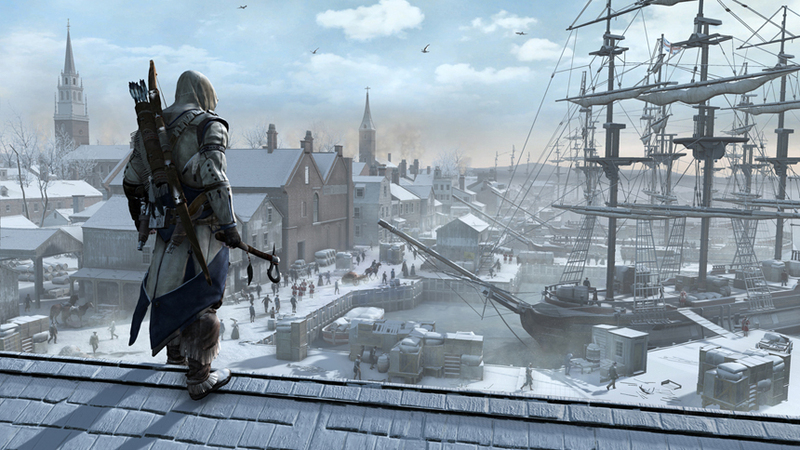 All AC games are without this feature, but with AC3 it feels especially lacking. The issue is, the game is simply too easy. In old AC games, armed with your sword and stabby little knives, and handy little wrist pistol, you could wade into a dozen sword-wielding men and come out alive. And while ridiculous, your character was supposed to be the best of the best, so fine, I could accept that. Those men would wait patiently to attack you one or two at a time with their swords, which was dumb, but hey, maybe your character was just that intimidating. 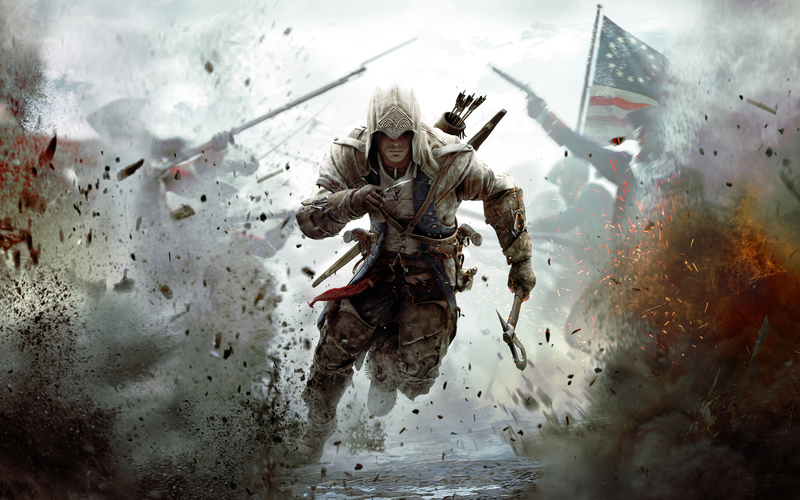 In AC3 though, these men are no longer armed with swords, they’re armed with muskets. Guns with swords duct-taped to them, basically. So, when you run into a group of 3 dozen such equipped men, armed only with your hatchet and your little stabby knives, and come out without a scratch on you… I’m sorry, it just doesn’t matter how good a swordsman you are, you should be dead. They still wait to attack you one at a time, even though all it would take to kill you is send a couple poor slobs in to fight you hand-to-hand, and then everyone else shoots you in the face. These things are supposed to be deadly. And that’s the thing, occasionally one of the soldiers you’re fighting actually remembers that the “sword” he has in his hand is actually attached to a giant gun, and he shoots you with it… and nothing happens. You fall back about two feet, regain your balance, and then proceed to kill him and all 35 of his other buddies. I’m not exaggerating about the number of soldiers you can take on at once. Wandering around Boston, I decided to see how long I could last when charging into two separate 12-men groups at the same time. 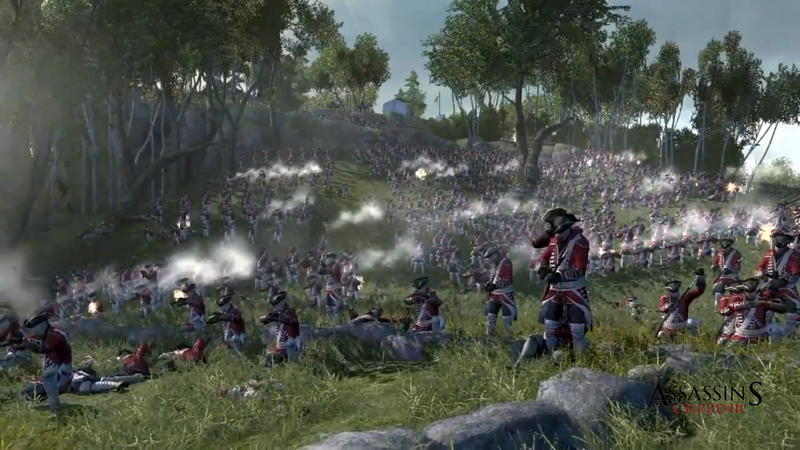 Very quickly, a third 12-man group joined the fray, and it was me vs. three dozen Redcoats. All I was using was my hatchet. After the 36th man had fallen, the answer was that I could last indefinitely should I have chosen. I had only been hit by a single bullet, had never one used anything other than that hatchet. The simple fact of the matter is that’s just too easy. This? Oh this is nothing to be worried about. Give me a spoon and I’ll dispatch them all no problem. Here’s the thing; this game is supposed to be about assassins. It’s right in the title. But why be an assassin when you can wander through the front gates of your local military fort with only a kitchen knife in your hand, and come out of that undamaged and victorious, having murdered countless firearm equipped soldier. There’s zero incentive to be an assassin. You’re just a super-powered thug. And that gives the game the worst quality you can say about any video game: It’s boring and pointless. Why care about any aspect of the game when it’s clear that the designers felt that the game itself was in the way of telling the story? And neither of the stories, neither the overarching story which is bizarre, nor the main character’s story which is interesting but not overwhelmingly thrilling, is enough to justify that decision. There are good aspects to the game. They should not be discounted. Like mentioned before, the game truly is gorgeous. It really is. The main character’s story really is good. Character movement is significantly smoother than older AC games, and the tree running is truly fun. The sea battles are simple, but really quite enjoyable. The tie-ins to history are as always interesting and fun. There are a wide variety of different mission types, so the missions don’t feel stale. The voice acting is really quite good for a videogame, and the while the main character often feels too even-keeled, when he does get emotional it feels and sounds authentic. Surprisingly good new tree running mechanic is legitimate fun. There are other issues aside from the lack of difficulty; the overarching story is still ridiculous, there is absolutely no reason to take any part in the item collecting-crafting-trading system, the main character seems emotionally suppressed and difficult to connect with, the frontier is gorgeous but devoid of anything to actually do; but all those are secondary to the difficulty problem. Change that one thing, make the game at least somewhat of a challenge, and you have a good game on your hands. In the end, it is that single issue of lack of difficulty makes the game not good. It would be so simple to fix, add in a difficulty setting, make the bad guys attack more than one or two at a time, make them hitting you actually hurt, make gunshots something to actually be afraid of, make them actually use their guns. Add that in, the game would be so much better. As it stands though, this just seems a waste of time. Impressive mechanics brought down by bad game design decisions. Simply not difficult enough, and that ruins the game. Despite some small glitches throughout the game, overall extremely impressive. You either love it, or you hate it. For both of the two stories. As always for an AC game, there are multiple strong characters. It’s fun at first, but once you realize how easy it is, it quickly gets boring. Connor, the main character, debating if it’s even worth bothering going into Boston to continue the story. This entry was posted in Reviews, Video Games. Bookmark the permalink. Danger, Alien Will Robinson, Danger!